Wood Buring Fireplaces Wood, a renewable resource, is the traditional fuel for a fireplace. Wood is actually energy from the sun, converted by photosynthesis and stored in a convenient form in trees! Burning the wood releases that energy for you to enjoy in your home when you need it! Wood creates a hot, cheerful fire with an ever-changing display of dancing flame. The Elite Series of Fireplace Xtrordinair fireplaces are EPA approved to maintain clean air and are highly efficient to get the most from your firewood. Two sizes of wood burning Fireplace Xtrordinair fireplaces are available to match the area you wish to heat. 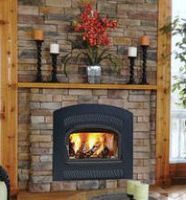 Several styles and finishes of faces are available to add the finishing touch to your fireplace. The advantages of wood are: Independence from utilities if the power goes out; an efficient, low cost fuel; extremely low particulate emissions that help protect winter air quality; and burning wood actually reduces the impact on global warming because firewood is carbon neutral.